WHAT TYPE OF SOLAR LIGHT ARE YOU LOOKING FOR? How We Picked Best Lights? Finding the best solar flood light wasn’t an easy task. To get to this flood light we went through more than 50 different models, starting from cheap solar wall lights to expensive dusk to dawn flood lights, each one a little different from another. 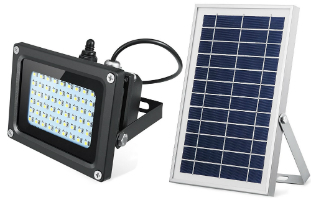 There are few key components that make up a great solar flood light – illumination intensity and brightness, efficiency and quality of solar panel, battery type and capacity, durability and weatherproofness of all parts of solar flood light, sensors included with the fixture and of course the price of the flood light. 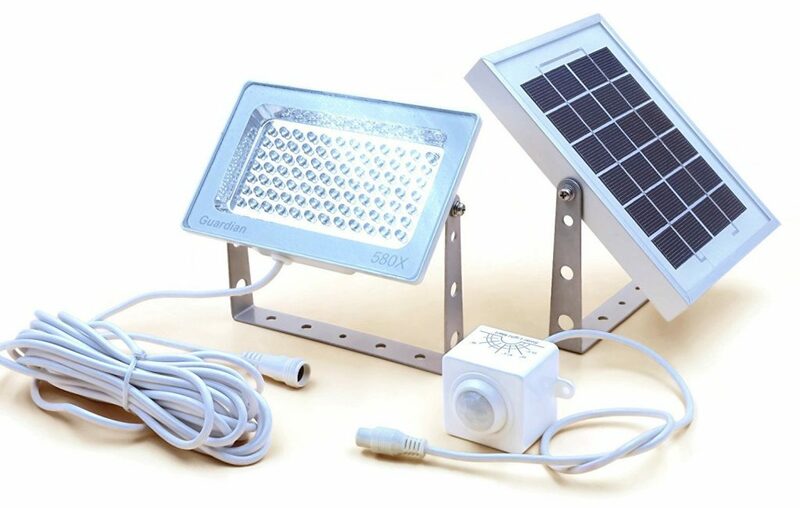 And not only the components are important but also how wide the range of applications is, meaning if the light can be installed both horizontally and vertically, does it come with adjustable mounts and ground stakes, how long is the cable that connects solar panel to the flood light and other similar factors. And last but not least, we also judged the manufacturer of the fixture – how well known it is, how many other products it has, for how long it has been around, how fast it responds to different user inquiries, how well they solve problems, how long warranty period they provide for their products, how willing they are to replace defective lights, and what is very important for solar lights (mostly considering rechargeable batteries) – how easy it will be to get replacements in the future. 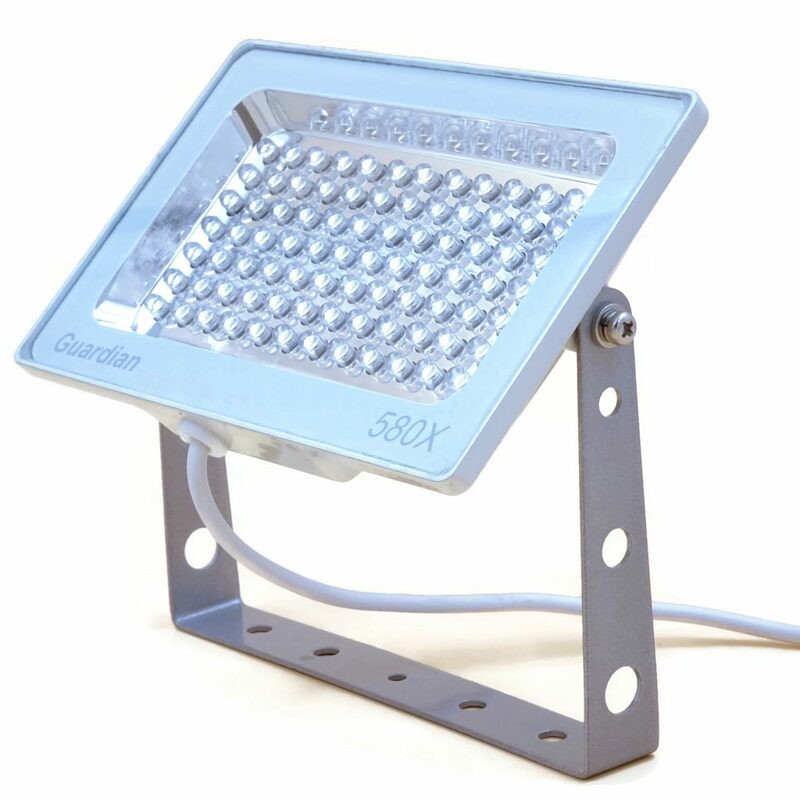 And considering all the previously mentioned aspects, we found one solar flood light that nails most of these previously mentioned points – Guardian 580X Solar Flood Light. This solar flood light features 84 amazingly bright LED diodes, high quality industrial grade aluminium solar panel, 2500 mAh lithium-ion battery providing up to 12 hours of illumination and a PIR motion sensor, all sealed in a fully waterproof cast iron and tempered glass casing. Excellent specs for an amazing price. There are a lot of solar flood lights now out there on the market, and they vary widely in terms of their quality. Sorting the wheat from the chaff, and finding the pick of the solar flood light bunch, is not an easy task – fortunately for you, though, we have already done most of the hard work, and come up with what in our view is the best solar flood light currently going around. And the winner is … the Guardian 580X. This device comes with 84 LED bulbs that together produce a grand total of 730 lumens of light. 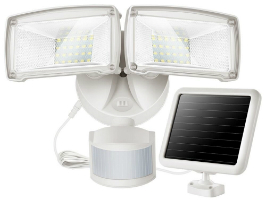 It is solar powered, with a 16 feet cable connecting the solar panel to the flood light; and comes with three lighting modes, plus its own PIR motion sensor (a 9-foot cable connects the motion sensor to your solar panel). It has a full aluminum body, and is IP65 certified, which means it is suitable for use outdoors in all weather conditions. 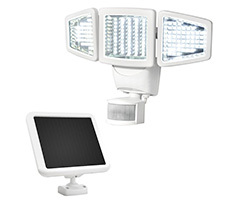 When it comes to the factors that make up a great solar flood light – brightness and lighting intensity, energy efficiency and quality of the solar panel, capacity of the battery, durability and ability to withstand all weather conditions, inclusion of additional features like motion sensors and dimmers, ground stakes and other mounting equipment, and of course the affordability of the light itself – this solar flood light beats most of the competition hands down. And not only does this product tick all of these boxes, it also comes from a quality manufacturer who have an established reputation in this market, and who provide excellent service and protection to their customers – whether in the form of generous warranties and product guarantees, responsiveness to complaints, and ease of obtaining replacement parts (like batteries). So without further ado, let’s take a look at the Guardian 580X. To begin with, let’s take a look at the range of places you can use this light. Both the light itself, and the solar panel, can be mounted on any solid surface – wall or floor – using the mounts included in the box. This means you can use the light as a security light (by placing on the wall), or as a landscape light (if you position it on the ground). Another benefit is that the mounts are made out of 100 percent metal (not plastic, like a lot of products in this line), giving you enhanced durability. In addition, there are 16 feet of cable connected the solar panel to the light – which gives you plenty of options as to where you place your light, though because this is a solar-powered light, you are still basically limited to those areas that receive plenty of direct sunlight during the daylight hours. Also, the mounts for the solar panel are non-adjustable, and you can’t alter the angle – which makes things difficult if you are not installing the panels on a flat, horizontal surface. When it comes to durability, this light is built from the sturdiest cast iron and tempered glass. All other fittings are made from stainless steel which is strong, and non-corrosive. The light’s frame is die-cast, waterproof and has received an IP65 weatherproof rating – which means it can be used outside the entire year round, whatever the weather conditions. The solar panel, meanwhile, is built from lightweight yet tough aluminum and tempered glass, and is also IP65 weatherproof rated; the motion sensor device is built from ABS (weatherproof) plastic. When you look at the IP65 rating, and the quality of the materials used in its construction, this is, without doubt, one of the most durable solar flood lights out there – it will stand up to whatever elements nature throws at it. PIR motion sensor mode, off to full brightness: upon motion being detected, the light puts out 730 lumens worth of light for up to a minute; otherwise, the light is off, no light is emitted at all. All in all, these are some very bright flood lights, they will easily illuminate an area of up to 50 square feet. With several of these lights, you will be able to illuminate your entire backyard! The color temperature of this light is 7000 Kelvins – ie warm, white colored light. The Guardian 580X comes with a 2-watt polycrystalline material solar panel that is very efficient at converting sunlight into power – though admittedly not as powerful as some other (for example, 10-watt) panels out there on the market. There is also built into the solar panel a cutting-edge LED driver that ensures a steady output of power from the panel, thus preventing the battery from being overcharged and having its lifespan reduced. The panel has a sturdy aluminum frame that will, like the light fixture itself, stand up under all weather conditions; and is connected to the light by a 16 feet long waterproof cable; meanwhile, there is a 3-foot long waterproof cable between the solar panel and the motion sensor. The solar panel can be mounted just about anywhere, all it requires is access to direct sunlight, and it will automatically convert solar energy into power that can be utilized by your lights when it gets dark. It does this by charging the 2500 mAh Lithium-ion rechargeable battery included with the light. While the battery does not have the highest capacity compared to some other models out there, thanks to the motion sensor feature of this floodlight, it will have no problem illuminating your yard through the entirety of the night-time period – making this a truly dawn-to-dusk light. The battery is installed inside the light fixture, so it will power your lights even when the solar panel is not connected as well. As goes without saying, though – and the same is true of any solar powered light – the amount and length of lighting coverage you get from this light depends largely on the amount of sunlight available to the panel during the day – which will differ depending on the latitude, and the time of year. Where the amount of sunlight available is only fair or average, you will get 8-10 hours of lighting at best from this light; on the other hand, in peak lighting conditions within favorable climates, you can expect a fully charged battery to deliver up to 12 hours lighting coverage with this light. One other very important point to take into consideration with solar lights is the ease of replacing the batteries, which have a lifespan of only about 2 to 3 years. Fortunately, Solar Light Mart do sell replacement batteries for their lights, so you shouldn’t have any trouble obtaining one when the time comes. As we have seen, included with this light is a passive infra-red (PIR) motion sensor that detects movement with a range of 10-12 meters of your light, and spanning an angle of 180 degrees. Whenever motion is detected, your light is triggered to either turn on – or become brighter; instead of being forced to have your light on at full intensity the whole night long, the motion sensor feature allows you to keep the light off – or on in dim mode – until someone comes into the area. This enables you to save light – and power – for when it is really needed, which is especially useful if you live in climates with high cloud cover and not a lot of sunlight during the daylight hours. There are three different working modes included with this light – as was explored above. In addition, this light has built into the solar panel a photocell sensor. As soon as the ambient lighting in the area drops below a certain level, the photosensor triggers the lights to turn on. In the same manner, once it starts getting brighter outside as morning arrives, the light switches off. There is also an on/off push button switch included with the Guardian 580X for good measure. Turn the light off on those nights you are sure you will not need it; or when you go away on vacation. Solar Light Mart is the manufacturer of this light. These guys are a relative newcomer to the solar flood light game, with only a handful of solar flood light products already out there on the market. However, despite their lack of reputation, all of their products offer full warranties and product satisfaction guarantees. In addition, they are, according to consumer reviews, very responsive to customer complaints and queries. They also claim to offer replacement parts for their products – including batteries that have reached the end of their lifespan. That’s yet another reason to choose the Guardian 580X! For the most part, the Guardian 580X is a quality solar flood light that ticks all the right boxes. Yet it still has a few shortcomings, as is to be expected. To start with, the cables connecting the light to the solar panel, and the solar panel to the motion sensor, might be a little short for some people’s liking. Also, it would be better if the motion sensor were connected to the light itself, rather than the solar panel. Another slight drawback of this light is that you can’t adjust how long the light remains on once motion has been detected – it is fixed at one minute’s illumination time, which may be suitable for some purposes, but probably not for all. The solar panel mount is not adjustable and is fixed at an angle of 45 degrees, so if you want to install it somewhere other than on a flat, horizontal surface, you may have to install additional mounting equipment. A few other areas where this light could improve are the lack of remote control – you have to change the working mode of the light manually each and every time; the lack of alternative options when it comes to brightness – there are only two brightness modes (full brightness at 730 lumens, and 55 lumens in dime mode); and capacity of the battery and power of the solar panel, which are not as impressive as some other comparable products out there on the market. 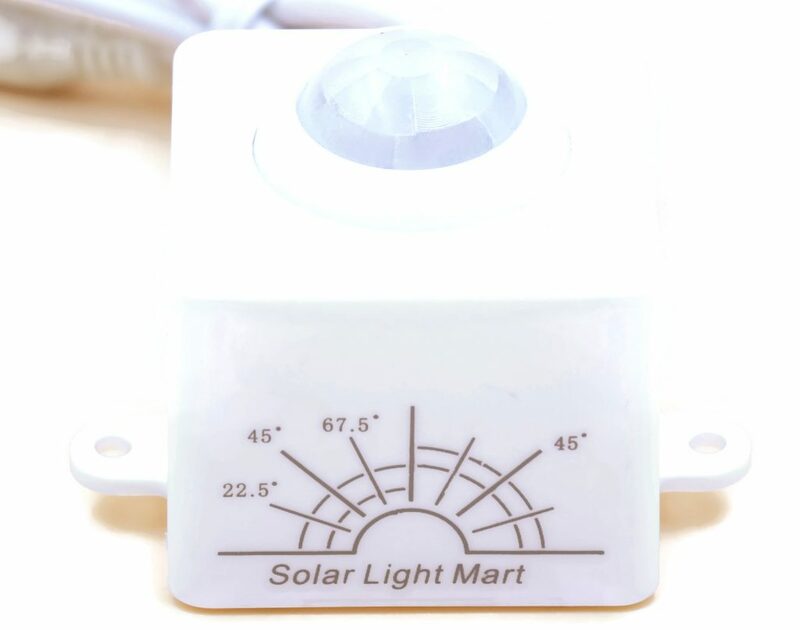 Finally, the manufacturer, Solar Light Mart, is not all that well known, so it’s not possible to determine the quality of this product from the previous track record of the company alone. Despite these minor shortcomings, the Guardian 580X is overall a quality solar flood light and gets our vote as the best light of this sort out there on the market at current. It’s easy to install, built with high quality, weatherproof materials, has excellent light output, and comes with its own motion sensor that enables you to save power and extend the lifespan of your light – this is one solar flood light that ticks all the right boxes. It’s backed by a one year manufacturer’s warranty as well – which is a testament, really, to the quality of this product and the faith the manufacturers have in it. How we picked the best solar flood lights? Solar flood light market has recently been swarmed with lots of good (and not so good) fixtures starting from small wall lights to powerful dusk-to-dawn flood lights and choosing the best one can be a very challenging and time-consuming task. So to make it easier for you, we have taken this job and picked the best out of best solar flood lights that will fit everyone’s needs. 1. Categorized solar lights for easier comparison. And at the end, we chose the single best solar flood light that we felt was the most universal one, had the best specs for the price and that we could recommend for everyone looking for a solar flood light. Components used and the overall quality of the fixture – First we looked at what components are used in the fixture and what is the overall quality of the product. The main factor that indicates whether it is a good fixture or not is the type of components used in the unit. For example, does it have a polycrystalline solar panel or some other type, does it have a lithium-ion battery or older Ni-Cd battery, is casing made out of durable aluminum or weaker plastic, does it produce lighting using LED diodes or other types of bulbs, etc.. Of course, using newer and more expensive components doesn’t automatically make one light better than other, so we didn’t base our decision just by the components of the fixture alone, but also looked at the overall quality of the light, how well it’s built, how long the light is expected to last and other factors. 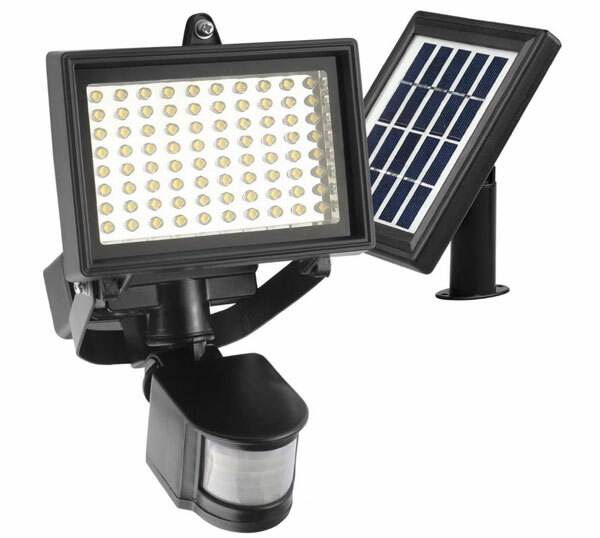 Features and specs – Each solar flood light type have its own unique features and specs that are important exactly to that light type. For example, security lights must have an adjustable motion sensor that can pick up motion in a longer range, dusk-to-dawn flood lights must have large batteries and solar panels that output enough wattage to charge these batteries fast, landscape flood lights need to have ground stakes to be placed in the ground etc. Price and value for money – It isn’t difficult to produce a powerful flood light, with large battery, high wattage solar panel and durable metal housing, but it is very hard to combine it all together in a well-priced fixture. Often we saw very high-quality solar flood lights with inadequately high price or the opposite, those solar lights that come at a bargain price contain some underpowered or cheap parts. So when choosing the best solar flood lights we did pay a lot of attention to the price and value ratio, picking those flood lights that offered the best value for money. User ratings – Price, components, and specs don’t tell you the whole story about a product, so we also paid a lot of attention to the ratings and reviews from other users, considering each good and bad review we could find about the product from its owners. Manufacturer reputation – Although not as important as other factors, the reputation and reliability of the manufacturer did play a role when we couldn’t choose between two flood lights with very similar specs. We preferred well-known manufacturers that had been around for a while and offered great customer service, provided warranty for their products and actually replaced any faulty items clients complained about, and that also offer replacement parts if anything needs to be replaced for the flood light in the future. Own testing experience – With multiple years of experience in running solar lighting websites and blogs, we brought in all our experience and knowledge to make this article as professional as we could, at the same time making all the important information simple and understandable for beginners to solar lighting. 3. 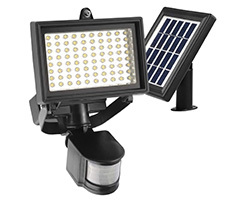 Compared five of the best solar flood lights in each category to find the winners. We took 5 best solar lights in each category (selected based on the criteria in the previous point) and compared them side by side making our final TOP3 list for each category. Then we made an extensive review of all three lights, listing both positive and negative aspects of them, to provide as much information as possible and make your decision of which solar light to purchase much easier. When to choose security lights? To illuminate an area at night for walking – People mostly choose to install solar security lights for practical reasons – to illuminate front doors, walkway, driveway or another path that leads to the house. Security lights are ideal for these kinds of situations because motion sensor turns the light on only when motion has been detected thus saving battery life in the remaining time. To deter burglars – When an unwanted person is wandering around your backyard in the dark, a sudden splash of light from your motion activated security light will not only surprise them but also unveil them to everyone nearby, therefore increasing the chance that they will immediately leave your property. To deter animals – Solar security lights are also great for deterring animals away from your yard. Most motion sensors can be adjusted to pick motion even from smaller animals like raccoons. Provide lighting for security cameras – Solar security lights can also be used together with security cameras illuminating the area that needs to be captured immediately when someone walks into that area. Provide illumination indoors – Solar security lights not only are useful outdoors but also can provide illumination indoors in areas such as staircases. Most solar security flood lights come with a separate solar panel that attaches to the flood light with a cable, so you can install the solar panel outdoors to pick up solar energy, while the fixture itself is installed and provides illumination indoors. The key factors of a solar security light that you need to pay most attention to are brightness and motion sensor. Make sure the solar flood light is bright enough to be able to fully illuminate the intended area and also that motion sensor has got a long detection range. As a bonus, look for solar security lights with an adjustable motion sensor that allows controlling illumination time, lux range and sensitivity or detection distance and range. High quality security light with 48 LED diodes, an effective amorphous solar panel and a 1500mAh capacity lithium-ion battery. Powerful and bright solar security flood light with amazing 150 LED diodes producing 1000 lumens and featuring a triple head design for better light coverage. Durable plastic housing with IP55 rating, built-in PIR motion sensor and high capacity 4500mAh battery makes this a top quality security light. Choosing the best solar security light wasn’t an easy task, because the range of motion activated solar lights has grown rapidly in the previous years. Comparing the most important aspects of security lights – brightness, light direction and coverage, motion sensor detection range and adjustment possibilities, our choice came down to 150 LED Triple Head Motion Activated Light by SunForce. What really pulled the trigger for this solar flood light was the power and brightness provided by amazing 150 LED diodes and triple head feature (each head has got 50 LED diodes) that allows adjusting the illumination in any direction needed. Often there is a need to illuminate not only one spot, such as front doors, but multiple spots at a single time, especially if it is for security purposes, and to do that, usually you would need to purchase and install multiple lights separately. This SunForce solar security light basically combines 3 flood lights in one reasonably priced fixture to offer an excellent lighting coverage in all directions. In our book, this is an exceptional deal! Not only us, but many reviewers on Amazon (the light has got one of the best ratings for any solar flood light) also praised the brightness of this flood light. In total it can output 1000 lumens of light, which is very respectable for a solar light at this price and will easily light up an area to uncover unwanted persons walking by your property. 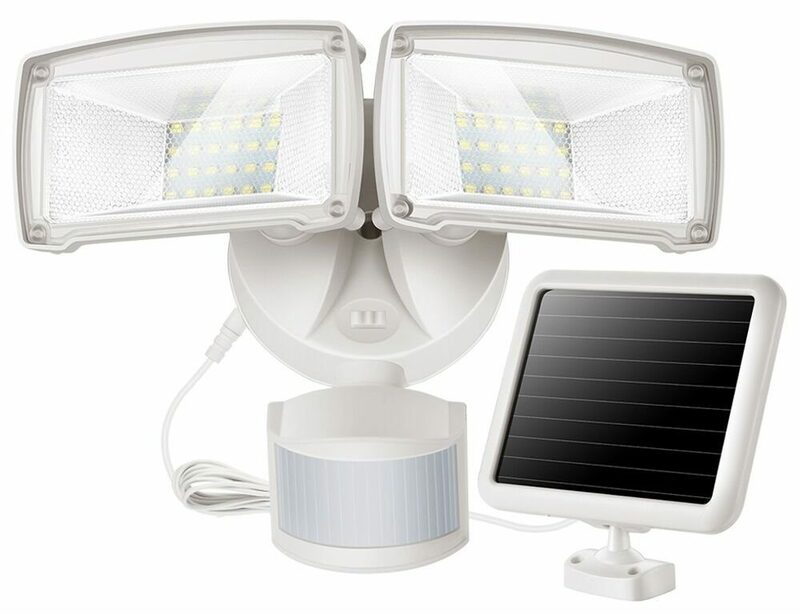 The solar powered flood light is equipped with a PIR motion detector that can pick up motion in 180-degree range, in up to 30 feet distance. You can expect similar results with the majority of motion activated flood lights. There is an option to adjust the sensitivity (detection range) and detection time of the motion sensor for different situations. To collect solar energy, the SunForce solar light uses an amorphous solar panel. We would prefer a more efficient polycrystalline solar panel for a light that can produce 1000 lumens of light, but amorphous panel used on this fixture isn’t bad by any means and will do its job of charging lights batteries. While we’re at it, SunForce has chosen to use three AA-size Ni-MH rechargeable batteries instead of Lithium-ion for the fixture. Similar to the solar panel, this seems a bit weird decision for such a powerful lamp to not use the more superior lithium-ion battery, but Ni-MH is definitely not the worse choice either. While it has lower specific energy than lithium-ion batteries, it is also cheaper and you can easily buy a replacement when the batteries run out. The light is going to be good for short periods of illumination (what motion activated lights are made for), but definitely won’t be able to provide continuous illumination from dusk to dawn. The fixture itself has got a durable, weather resistant plastic housing. Although the manufacturer hasn’t indicated anywhere the IP rating of the light, based on our experience with similar fixtures, we can guess that it is either IP44 or IP45 flood light. The light should run outdoors without any problems all year round. The cable length from solar panel to fixture is 15 feet and the flood light comes with wall mounting hardware. If you are still in doubt whether to get this flood light and want the last bit of convincing, we can recommend the manufacturer of the fixture – SunForce to be a well known and respectable brand in solar flood lighting. Also, the solar flood light comes with a 1-year warranty. All in all, this is really a great solar security flood light without practically any major drawbacks. 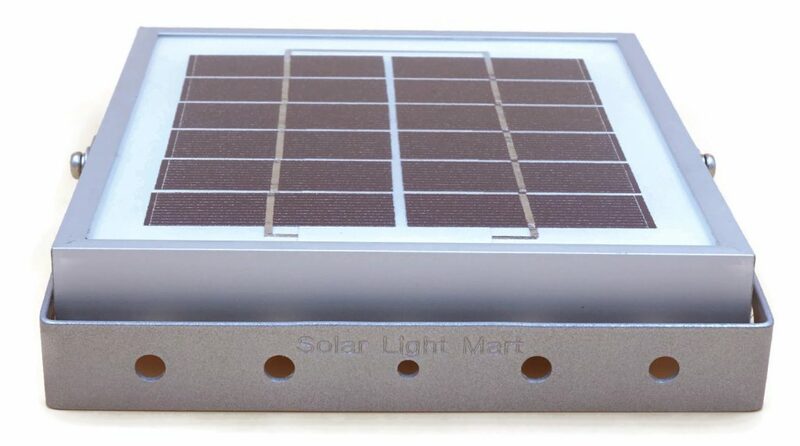 As previously mentioned, we would like to see a little bit different choices for few lamp components, such as polycrystalline solar panel instead of amorphous and lithium-ion battery instead of Ni-MH, but these aren’t really drawback, because they help to keep the price of the fixture so low and overall the light works very well. The only real drawback we could find is that the fixture is not equipped with a dusk to dawn sensor, but instead, you have to manually turn on the “always on” setting for continuous illumination. This, however, will drain the small battery in just a few hours so you won’t get a full night illumination from this flood light. 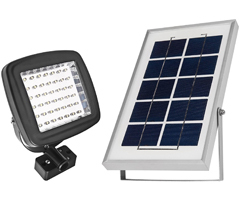 What are the qualities you look for in a good solar security light for your entryway, garage, yard, patio or other external parts of your property? Ideally, it will be bright, weatherproof, and with a powerful and effective motion sensor built into the light. And as a solar powered light, the solar panel should be able to collect sunlight and efficiently charge the battery so that it is ready to go supplying light to your property at night. Well, the SOLLA Security Light satisfies all of these requirements, thus making it one of the best solar security lights out there today. Read on to find out more. This adjustable head flood light is equipped with a high tech LED lamp that emits a super-bright 950 lumens of light. You can either set the light to Auto (motion sensing) mode, in which it emits 950 lumens of bright, white light only when motion is detected (it is off the rest of the time) or constant ON mode, in which it emits 950 lumens constantly throughout the night. The light head is rotatable as well, which enables you to achieve more focused, targeted lighting. If you choose to avail yourself of the AUTO mode in this light, then the motion sensor has a range of 49 feet spanning an angle of 180 degrees. And when motion is detected by the passive infrared (PIR) sensor, the light stays on for one minute before turning off again. This light is solar powered, and the panel is an amorphous solar panel, which means it charges in all conditions and does not require access to direct sunlight. It has a capacity of 8 watts which will enable it to charge the battery quickly and efficiently. One lithium-ion battery is included with this light, it charges quickly and has excellent storage capacity so that it will be ready to go supplying light to your property of a night time. Fully charged, it will provide up to 10 hours lighting coverage – whether in auto or on mode. The light fixture and solar panel are housed in IP65 weatherproof, plastic material that will endure all weather conditions, whether rain, snow, wind or scorching summer sun – this truly is a light ‘for all seasons’. It has a lifespan of 50,000 hours. This light is backed by a one year manufacturer’s warranty. There is also a 60 days money back guarantee, so should you be in any way dissatisfied with your purchase within this time frame, you can return to the manufacturer and get a full refund, no questions asked. There are 9 feet of cable connecting the light to the solar panel, which gives you plenty of options as to where you position your light. 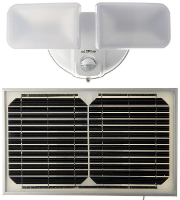 You get the wall and horizontal mounting brackets for both the light fixture and the solar panel as well. As with other lights reviewed here, this light would benefit from a remote control option to change the settings from afar. It would also make for a better light if there were more lighting modes and if you could adjust the brightness – for example, if you were able to have the light constantly on in dim mode, which converts to full brightness when motion is detected. Also, you are not able to adjust the length of time the light stays on for after motion is detected – which would enable you to save power when it is needed. These – albeit minor – disadvantages, prevent the SOLLA security light from taking the prize as the number one solar security light going around today. For a quality solar security light, this offering from OPERNEE has few rivals. 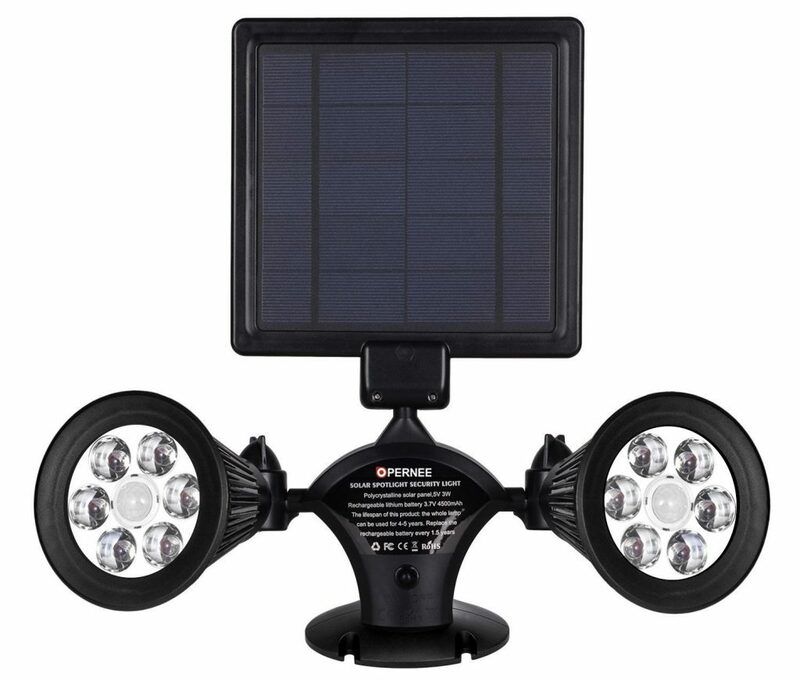 Super bright, adjustable, solar powered and eco-friendly, and comes with its very own motion sensor, the OPERNEE Dual Head comes with everything you could ask for in a light of this sort. Read on to find out more. There are 6, dual head, LED lights included with this product, each light comes equipped with a lamp on either side, and each emits 50 lumens of light. This gives you a grand total of 12 LED pieces, and 600 lumens of bright – excellent lighting coverage that will allow you to illuminate your yard, patio, deck, garden and more. And because lamps are installed on each side, you get an illumination angle of 360 degrees with each one of these lights. The color temperature of these lights is 6500-700 Kelvins. This light comes with its own built-in passive infra-red (PIR) motion sensor, that can detect movement up to 26 feet away, ranging an angle of 120 degrees – when this occurs it will automatically turn the light up to bright mode (600 lumens) for a full minute after motion is detected, before returning it to OFF mode. There is also a photosensor built into these lights, so that they automatically turn on at dusk, off at dawn. The motion sensor is not active during the day. No external power source is required with these lights, this is green energy at it’s finest! The 3 watts, 6 inches by 6 inches solar panel is made from the highest quality polysilicon material that will efficiently convert sunlight into electricity that you can utilize as light in your yard. All it requires is exposure to direct sunlight during the day. The solar panel charges a 4500 mAh lithium-ion battery, courtesy of the solar panel it will be fully charged in 4.5 hours given optimal sunlight conditions and will deliver 9-11 hours continuous lighting for your yard. The light is constructed from IP55 weatherproof, ABS plastic that will stand up under all conditions. It’s backed by a one year manufacturer’s warranty. There are 16 feet of cable connecting the solar panel to the light. And screws are included for mounting the light fixture and solar panel on your surface of choice. This light only has one lighting mode – off to full brightness motion sensor mode. This is appropriate for a security light intend to scare away intruders, however, this light would be a lot more versatile if it had dimming option or a dim light to full brightness motion sensor mode. You also can’t adjust the length of time the light stays on for after motion is detected. For these reasons, we can’t give the No. 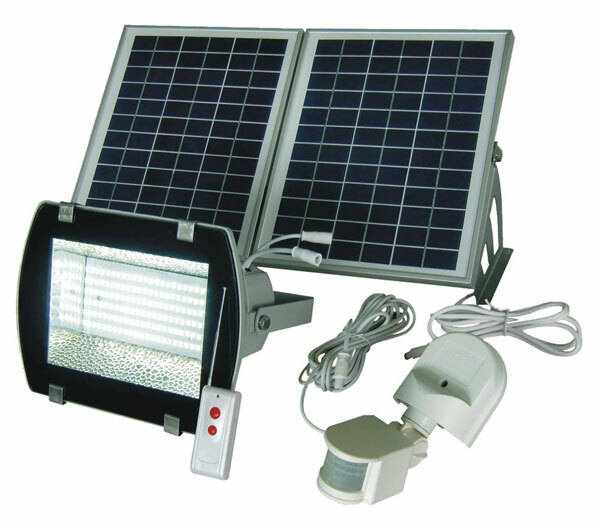 1 ranking to the OPERNEE Dual Head solar security light. It’s still a great light though! ELEDing EE814WDC solar security light delivers dusk-to-dawn motion sensor, solar powered/ eco-friendly lighting that is suitable for all weather conditions. IPM programming automatically adjusts the light emitted to suit the external weather conditions – saving you power for when it’s needed most. Despite these advantages, it is not nearly as bright as comparable lights in this market – only equivalent to a 60-watt Halogen lamp – and the range of the motion sensor is quite limited as well. MAXSA Innovations 44449-L – great flood light with 100 bright LEDs with over 500 lumens of brightness, large 4400 mAh Lithium-ion battery and adjustable PIR sensor with 40 feet detection range. However, the price is a bit higher than for other, similarly equipped security lights we chose for this list. When to choose dusk to dawn lights? Out of all types of solar flood lights, dusk to dawn lights must meet the most strict criteria to be considered a successful light, because these type of lights are used outdoor practically all year round and need to provide continuous illumination from sunset to sunrise. The application range of these lights is very broad, they can be as good security lights as landscape lights. Dusk to dawn flood lights are the most versatile outdoor lighting options, but all that comes at a much greater price. To be able to power bright outdoor flood lights, the lighting fixture needs to have a decent sized battery and to charge that battery there must be an efficient solar panel (monocrystalline or polycrystalline) that outputs enough wattage to be able to recharge the battery during the daytime. And not only that but also the casing of the flood light must be durable enough, to protect all these components from any (solid or water) damage. And in a result, solar dusk to dawn flood light that consists of all these powerful, high-end components will cost you from $100 even up to $1000. So the key components you need to watch in a dusk to dawn solar flood light are battery type and capacity, durability and IP rating of whole fixture (including solar panel and sensors), solar panel type and wattage, and brightness. Probabaly the best equipped dusk-to-dawn flood light on the market also feautring an adjustable motion sensor and a remote control. This dusk-to-dawn light has it all - 1200 lumens of light and intelligent power management software with everything safely sealed in a heavy-duty IP65 polycarbonate casing. One of the best dusk to dawn lights which has 44 LED diodes producing up to 1000 lumens. And It will provide up to 10 hours of worktime with its high capacity 8000mAh lithium-ion battery. When it comes to dusk to dawn solar lights, few devices compare with the leading 1200 lumens solar flood light. The ELEDing 1200 lm solar light features ultra-bright LED 3rd generation illuminators, IP65 weatherproof design, and cutting-edge SMART light saving technology that enables you to save power and achieve true ‘dusk to dawn’ outdoor lighting. Read on as we explore just what makes this the number one rated dusk to dawn solar flood light on the market today. This light comes with two LED 3rd generation illuminators that together produce a maximum light output of 1200 lumens of white, daylight color temperature light (7000 Kelvins) that delivers enhanced full-color-image vision – and far outperforms your traditional 120 watts incandescent bulb in terms of both brightness and light quality. The LED illuminators have adjustable heads which enable you to either combine or separate their beams, achieving more precise, targeted illumination. Choose SMART mode (the default setting of these lights), and it will provide all-night, dusk to dawn illumination, functioning in dim mode until motion is detected, after which the light automatically switches to maximum brightness. But that’s not all. With the innovative Intelligent Power Management (IPM) software built into this light, the brightness level of the light emitted by these lamps automatically varies in accordance with the external weather conditions. You can also manually dim the lights using the dials situated on the light body. As we have seen, this light is also a motion sensor light. Under SMART mode, the default setting, it automatically switches from dim light mode to maximum brightness when motion is detected. Alternatively, you can choose the SMART AUTO setting on your light, and it will operate as a conventional motion sensing security light – ie lighting up to maximum brightness when motion is detected; the rest of the time the light is off. On either setting, the motion sensor has a range of 30-40 feet, spanning an angle of 180 degrees, and triggers the light to stay on for a minute after a motion is detected. In order for this light to be a true dawn to dusk floodlight, it needs to have a photo-sensor built into it as well, and the leading 1200 lumens certainly does. Switch your light to ‘on’, and when ambient lighting levels in the surrounding environment drop to a certain level, the light will automatically light up; similarly, when ambient lighting levels start to increase as morning approaches, the light will automatically switch off. The IPM power saving software built into this light also alters the lighting output of this light to compensate for external weather conditions. 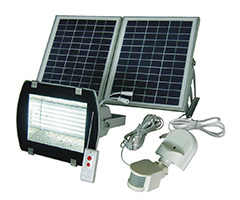 This is solar powered lighting, which means no external power source is required; all you need to do is place the solar panel in an area that receives plenty of sunlight during the day, and the attached battery will automatically charge your lights so that come nightfall they are ready to go illuminating your yard. The 8 watts solar panel that accompanies this light is built from tempered glass and high-quality polycrystalline material, it also comes with its own (adjustable) mounts and 10 feet worth of cable for connecting to the light fixture itself – which gives you plenty of options as to where you position your lights. With 8 watts charging capacity, you can be sure it will charge the battery quickly and efficiently as well. A rechargeable 28 watts Lithium-Poly AA battery is built into this light so that the power accumulated by the solar panel during the day can be saved and stored for when it is needed after dark. The battery has a long lifespan, so that it can be recharged by the solar panel many times over, and has an excellent capacity compared to comparable batteries out there on the market. Given a full day’s exposure to sunlight, the battery will deliver up to 10 hours continuous lighting to your yard – whether you choose full brightness or dimmed mode. All components included with this light are housed in durable, well-built components. The light fixture and solar panel are housed in heavy-duty polycarbonate material that is IP65 rated – meaning it is completely weatherproof and will stand up under all climatic conditions. The solar panel also is designed with tempered glass that is very durable. Sturdy, all-metal, wall and ground mounting stakes are included with this light as well. It’s backed by a one-year limited manufacturer’s warranty. And wall and mounting stakes, and full installation instructions are included with this light, free of charge. Whilst the LEDing 1200 lumens is a really fantastic little solar flood light, it is still far from perfect. It could benefit from the inclusion of a remote control that enables you to change the settings from afar instead of manually. Also the mounting brackets and solar panel head are not adjustable, so you can’t alter their angle relative to the sky as the position of the sun changes through the year. You will need to purchase additional equipment to do this. Finally, you can’t change the amount of time the light stays on for after motion is detected – which would come in handy on those occasions where you want to save power. Compared to the many advantages of this light, though, these are minor shortcomings. 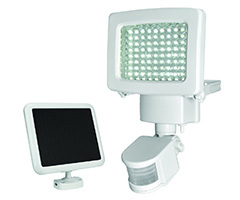 A great contender for the best dusk-to-dawn flood light title is the SGG-F156-2R solar flood light by Solar Goes Green. This is a fully equipped dusk to dawn fixture that in addition to two polycrystalline solar panels and 180 bright LED diodes also features an adjustable motion sensor and a remote control, all things to make this the best dusk-to-dawn solar flood light on the market. So why didn’t it make the first spot on our list? Simply, all these great features come at a much higher price, which we think might be out of budget for most homeowners that are the target audience for this article. But because this is one of the best solar flood lights on the market, we must look at it in more details. Solar Goes Green SGG-F156-2R has got 156 LED diodes that produce total 780 lumens of bright white light, which may not seem that much, but actually the flood light is very powerful and will lit practically anything, from your backyard to a parking lot, commercial signs and anything else. To make this an ideal outdoor light, the fixture and solar panel have got rugged aluminum bodies, the design of the fixture (except the motion sensor) is totally weather-proof, allowing to use the flood light outdoors all year round. Unfortunately, Solar Goes Green haven’t listed the IP rating of the flood light, but it should be at least IP65 rated fixture. The length of two cables – one from flood light to solar panel and other from the flood light to motion sensor is 15 feet, allowing a wide range of installation choices. There are also 4 ground stakes included in the packaging, so you can choose to install the light on a wall or other vertical surface or in the ground and use it as a landscape light. Similarly to MicroSolar 180 LED fixture, this flood light also has got two 10W polycrystalline solar panels (20W in total) which, as we previously mentioned, is an excellent choice for dusk-to-dawn flood light. The polycrystalline solar panels charges a 7000 mAh large lithium iron phosphate (LiFePO4) battery, which is able to power the light for about 10 hours with a full charge. The fixture requires about 8-10 hours of sunshine to fully charge its batteries. You can also purchase a flag pole mount separately for this fixture. What makes this dusk to dawn flood light to stand out among the rest is the ability to connect a fully adjustable motion sensor. The sensor has got a 40 feet detection range and you can adjust the sensitivity, lux detection settings and lighting time from 10 seconds to 5 minutes. And because this is a dusk-to-dawn flood light, it is obviously equipped with a photosensor, so you can choose whether the light will work as a normal dusk to dawn flood light, automatically turning on at dusk and off at dawn, or as a motion activated flood light. Another great feature of this solar flood light that you won’t find in practically any other lighting is a remote control which allows you to operate the flood light from a distance. This is especially useful if you have installed the fixture high above the ground and don’t want to climb up the ladder each time you need to change illumination settings of the fixture. First of all, although this is one of the most feature-packed solar flood lights on the market, we felt that the price of it is just a bit too high looking at the prices of few competitor dusk to dawn flood lights. And second, considering the build quality and materials used to make the flood light and solar panel, we didn’t understand why motion sensor was made out of plastic and was not fully water proof (while it would stand most weather conditions, some heavier downpour could damage the sensor). This solar powered, motion sensor flood light from RuggedGrade is one of the best dusk to dawn solar flood lights out there on the market today. The RuggedGrade 1000lm flood light utilizes cutting edge, 10 watt LEDs that together deliver 1000 lumens of super bright, white light (5000 Kelvins color temperature) in full brightness mode. That’s more than enough to illuminate your balcony, deck, garden, landscaping – or any other features in your yard! The PIR motion sensor included with this light has a range of 5 meters. After detecting any movement, it automatically increases the output of your flood light from 10 percent capacity, dimming mode, to full brightness. It remains bright for 30 seconds before returning to dim mode. This light also has an in-built photosensor so that it automatically turns on at dusk, off at dawn. The motion sensor is not active during the day. The polycrystalline, 5 watts solar panel is what powers your lights, it collects sunlight during the day and efficiently converts it into electricity that you can utilize in your yard as light after dark. You can directly mount it onto your wall of choice, or other horizontal surfaces. You can adjust the angle as required to maximize sunlight exposure. The premium super sized 8000 mAh lithium-ion battery built into this light charges quickly and has an exceptional capacity. It can deliver up to 10 hours continuous lighting to your property of a night-time when fully charged. It’s also much longer lasting than your average battery and will run for many years before replacement is required. The light and solar panel are built from sturdy, high-quality aluminum and plastic materials, with tempered, shock-resistant glass. They have an IP65 weatherproof rating, which ensures they will stand up under all conditions, and throughout the year. It’s backed by a full one year manufacturer’s warranty. And there are 16 feet of cable included for connecting the light fixture to the solar panel. And screws and mounting stakes are included to install your light and panel. It would be good if you could dispense with the motion sensor as required, and use your light simply as a normal flood light at a medium or full brightness. That would certainly enhance its versatility! It would also be to this light’s advantage if it came with its own remote control for changing the settings from afar. These are minor quibbles, however – the RuggedGrade solar motion sensor light is still a high-quality offering. Well and truly recommended! The SunBonar 800 lumens dusk to dawn solar flood light delivers super bright (800-1000 lumens), long-lasting (8-10 hours) solar powered lighting for your yard. With an IP66 weatherproof rating, it will deliver year around coverage as well. However, it lacks any kind of dimming option – and there is no motion sensor feature either – which limit it’s versatility somewhat. While ALPHA 1200X dusk to dawn solar flood light comes with 180 LED pieces and three brightness settings (150, 500, 1500 lumens), making it suitable for just about any lighting purpose you might have in mind for your yard. With 16 feet of cable connecting your light to the solar panel that powers it, you can place it just about anywhere as well. However, it lacks a motion sensor feature, and it has a rather flimsy, lightweight design. When to choose landscape flood lights? Landscape flood lights are used to illuminate different objects whether it is a commercial sing next to a road or some interesting object in your backyard such as a fountain or an old tree. Landscape lights are mostly used for aesthetic purposes, to showcase something or make something stand out in the night rather than for security reasons as other types of solar flood lights. And often they work similar to dusk-to-dawn lights providing continuous illumination during the night. 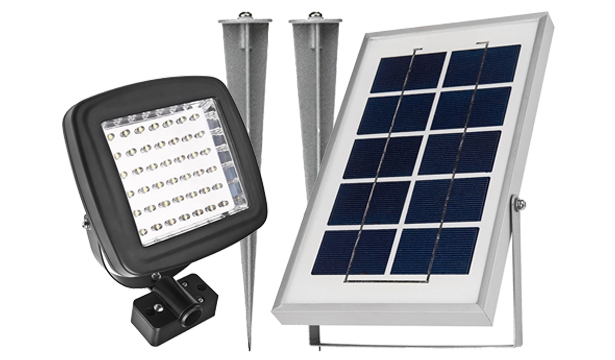 Because of this, the key features to look for when purchasing solar landscape lights are durability (casing material and IP rating), battery capacity, solar panel type and wattage, and mounting hardware supplied, because mostly landscape flood lights are placed in the ground so the light should include ground stakes for solar panel, flood light or both. Why landscape flood light instead of landscape spot light? Often solar landscape spot lights are the more popular option than solar landscape flood lights, so in which case should you install flood lights instead of spot lights? We recommend installing flood lights when you need to illuminate a larger (wider) object or area. Flood lights are designed to produce a wider beam of light, which can illuminate a larger area, while spot lights have a more concentrated beam which is great if you need to illuminate a smaller object but with more intense light. Also, landscape flood lights tend to be brighter and most can illuminate from dusk to dawn, so if you need a powerful light, that covers a larger area and can provide illumination throughout the whole night, get a solar landscape light. Thanks to the 2-watt polycrystalline solar panel and 2000 mAh rechargeable battery this 120 lumen fixture can run for up to 10 hours. Thanks to the 3W polycrystalline solar panel and 4000 mAh lithium-ion battery this 180 lumens bright fixture can run for up to 10 hours. Powerful 6-watt polycrystalline solar panel and a 4400mAh mAh battery allows this solar landscape light to illuminate your space for up to 12 hours straight. If you need a good quality solar landscape light that has enough power for most uses, you may want to consider this – MicroSolar FL2 solar flood light. The flood light has got 64 LED diodes that produce total 180 lumens of light, enough to illuminate not only some landscape objects but also a smaller parking lot, driveway, a walkway and similar areas. The flood light can be mounted to a wall or other vertical surface or placed in the ground with three ground stakes (one for light and two for solar panel) and used as a solar landscape lighting. Because this is a more powerful light, it also requires a more powerful solar panel. 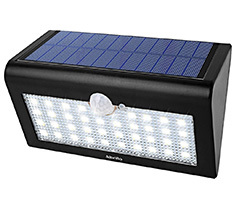 FL2 solar flood light is powered by a 3W polycrystalline solar panel that charges a 4000 mAh lithium-ion battery. In most areas, during the summer months, the light will run about 8-10 hours with a full charge or about 6 hours if its cloudy throughout the day. As expected from lights manufactured by MicroSolar, the fixture is equipped with the most up-to-date, efficient and long lasting components such as LED diodes, polycrystalline solar panel, and lithium-ion batteries. The housing of the flood light has got an IP65 rating so you can use it outdoors all year round. 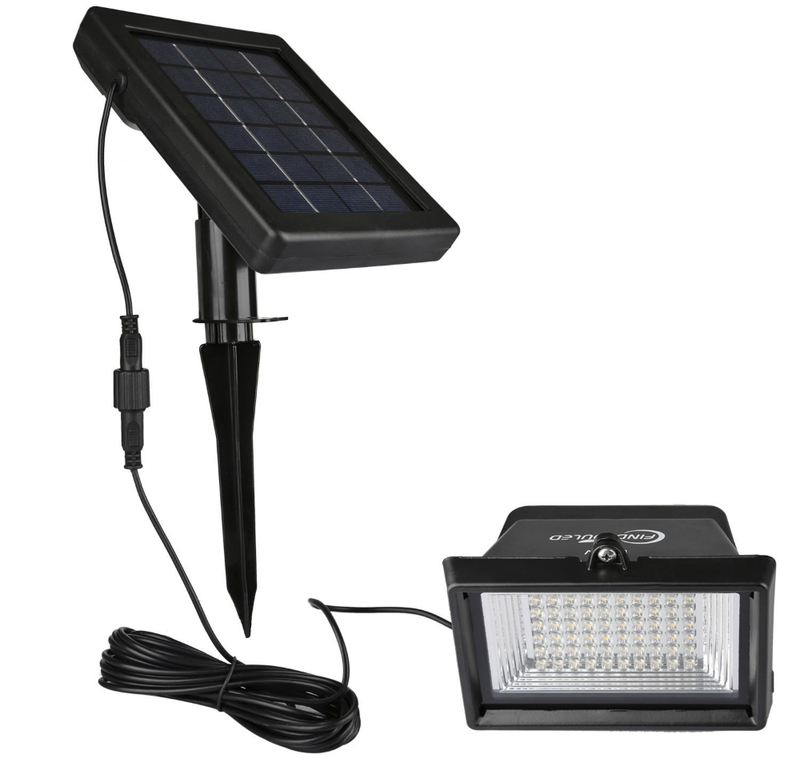 There is a 16.4 feet long cable connecting solar panel with the flood light fixture and you can also get an additional 16.4 feet extension cable (as with other MicroSolar lights). There is no motion sensor on the MicroSolar FL2, but there is a photocell in the solar panel, as you would expect from a solar landscape flood light, so the light will automatically turn on and illuminate during the night and then turn off when the sun reaches the solar panel again in the morning. This light has got an on/off switch behind the solar panel, so you can actually control when the light illuminates and can turn it off at night if you don’t need light. The manufacturer MicroSolar provides a 1-year warranty for this flood light. First of all, this is not the cheapest light considering its light output is just around 180 lumens. While it’s perfectly fine for most applications, some may find the light to be just a bit too dim to properly illuminate an object. And second, attaching the metal mounting bracket to the back of the solar panel is a bit complex, because you need to hold the nut to tighten the screw, but there is a very small place to access it, so some extra tools may be needed to do the job. Would you like to show off your garden and landscaping after dark, and in a manner that saves money and is good for the environment? Then the Findyouled 60 LEDs solar flood light may be the product for you. Super bright, adjustable and 100 percent weatherproof – this is one of the best solar flood lights going around today. You can use it to illuminate your trees, garden, pathways, patios, decks, signage – or any other feature of your yard that you deem to need lighting. Read on to find out more. The Findyouled flood light comes with 60 powerful LED bulbs that together emit a maximum light output of 120 lumens. The light emitted spans an angle of 60 degrees, wider than many comparable lights out there on the market. You can also dim the light to suit your lighting requirements, and to save power. This is not a motion sensor light, however, it is light sensitive, such that it only turns on once ambient lighting levels in the environment drop below a certain level; in the same vein, once it starts to get brighter as morning approaches, the light will automatically turn off. This quality of the FindyouLED 60 LEDs flood light makes it a true ‘dusk to dawn’ outdoor flood light. Free, clean energy is yours’ for the taking with this solar-powered light. No external power source is required, just install the rotatable, 7.6 by 6.1 inches, 2 watts solar panel in an area where it will receive plenty of sunlight during the day and it will charge the battery attached to the light quickly and efficiently. And because this is an amorphous solar panel, it will charge well even in cloudy weather. The light comes with a 2000 mAh rechargeable, lithium-ion battery that charges quickly and has excellent storage capacity – it will deliver between 6 and 15 hours continuous lighting (in full brightness mode) to your yard depending on the quality and amount of sunlight the panel receives during the day. The Findyou LED light fixture is housed in sturdy cast aluminum material that has a black finish, locking ring plus rubber gasket that ensures it will withstand rain, moisture, wind and intense summer sun. It has an IP55 weatherproof rating. The solar panel is housed in weatherproof, tempered glass. It’s backed by a full, 3 years’ manufacturer’s warranty. Included with this product are 16.4 feet of cable connecting the solar panel too the light fixture. There is also a 2-in-1 installation feature, ie you can either stick your light and solar panel into the ground using the mounting stakes included with this product or hang from the wall using the screws also contained in the box. A motion sensor feature would add to the Findyou LED’s versatility, whilst a remote control option would make it much more convenient to change the settings without having to dismount the light each and every time. Also, this light only has a maximum light output of 120 lumens, spanning an angle of 60 degrees, which is not as impressive as some other comparable lights on the market. In larger yards and gardens, you may require several of these lights to get maximal lighting coverage. Despite its impressive credentials, because of these drawbacks, we can’t give the Findyou LED flood light the prize as the best solar flood light on the market. This solar flood light from SunBonar is super bright, eco-friendly and fully weatherproof – which qualities make it one of the very best landscape solar flood lights out there on the market today. Read on to find out more. The SunBonar 54 LED flood light comes with 54 LED pieces that together deliver a maximum light output of 400 lumens which is more than capable of illuminating your yard, garden, walkways, patio, balcony, deck and more. The light emitted is of a warm, white color (6000 Kelvins color temperature). This is not a motion sensor light, however, it is a light sensor light. That is, your lights are so designed that they detect the ambient lighting levels in their environment and accordingly turn on automatically at dusk, and switch off at dawn. There is no need to switch them on and off manually each day. This wireless outdoor landscape flood light is powered by a 6-volt/6-watt solar panel made from the very finest polycrystalline silicon material that efficiently collects sunlight during the day and converts it into electricity that your lamps can utilize as light after dark. The solar panel charges a 3.7 volts, 4400 mAh lithium-ion battery that delivers up to 12 hours continuous lighting (during summer), and a still impressive 7-8 hours during the winter months. The light and the solar panel are both encased in tough, durable aluminum and tempered glass materials that is IP65 weatherproof rated – this is one set of lights that will endure whatever the natural elements hurl at it. The SunBonar solar landscape flood light is backed by a full one year manufacturer’s warranty. This light from SunBonar comes with 16 feet of cable for connecting the light to the solar panel. 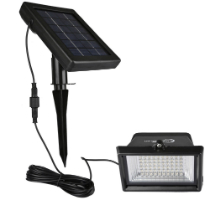 There is also included equipment that gives you three installation options: stick the light and panel in the ground using the included mounting spike; mount upon the wall using the screws, also contains in the box; or fix the solar light to the solar panel using the same screws. This light from SunBonar, whilst an effective solar landscape light, only comes with one working mode – there is no dimming option, no motion sensor feature that would enable you to keep your light on in dim mode until movement is detected, upon which it increases to full brightness. This certainly detracts from the versatility of the SunBonar solar flood light – and prevents it from being our selection as the best landscape solar flood light on the market today. It’s still a fine light, though, and well worth the investment of time and money. 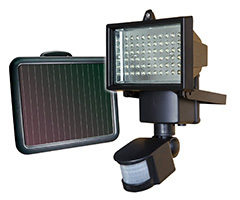 The MicroSOlar FL3 108 LED landscape solar flood light comes with 108 LED pieces, and has a light output of 400 lumens spanning a 60 degrees angle. Given optimal sunlight conditions, this solar powered light deliver up to 12 hours continuous lighting. You can also mount it either on the wall, or stick in the ground using included mounting spikes. There is no dimming option, however, and it doesn’t function as a motion sensor light either. The LTE 60 LED landscape solar flood light will light up your yard, balcony, deck, patio, garden, and more with no problems. It comes with 60 LED pieces and has a 300 lumens light output with 120 degrees beam angle. IP65 weatherproof rated, there also two installation options – stick in the ground or mount from the wall – all equipment provided. On the other hand, there is no dimming feature, and these are no motion sensor lights either. When to choose wall mounted lights? When looking for a wall mounted solar motion sensor light there are few things you must pay more attention to – the ease of installation, brightness, motion sensor and its customisability and, of course, the brightness. There might be several reasons why you would want such a light, whether to provide lighting for security reasons, for decoration purposes around your house or in your backyard, to scare off animals from your yard or any other reason. And depending on your needs, certain features and specifics might prove more useful to you. Because the market is filled with very similar looking solar wall lights, we have picked the best according to their level of brightness and size – one smaller 10 LED light, one medium 20 LED light and one larger 38 LED light. We see this type of light best fitting situations where a relatively small area that serves a certain function should be illuminated, so it is easier to see at night, for example, front doors, stairway or sidewalk (multiple lights might be needed). Larger and brighter than our top pick, this fixture features 54 LED diodes, 8-watt solar panel, passive infra-red PIR sensor and a lithium-ion battery. The best light for everyone - it is compact and bright for its size, has got a decent battery life, adjustable motion sensor and a very attractive price. Larger and brighter than our top pick, this fixture features 38 LED diodes, 2.5W solar panel, adjustable PIR sensor and a 4400 mAh lithium-ion battery. 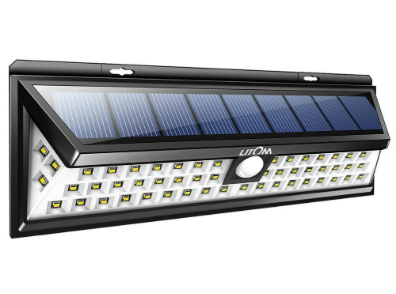 The option that might suite most people is this – Litom 20 LED wall mounted solar motion light. It offers the best of all worlds – it is compact, relatively bright for its size, has got pretty decent battery life, adjustable motion sensor and very attractive price. Choosing the best wall mounted solar light was very difficult because the market is swarmed with very similarly designed lighting fixtures (different companies selling exact same light simply putting on their own branding). 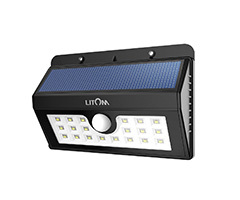 And the one light that had a slight edge in all our criteria over the rest was this Litom 20 LED model. The solar light has got 20 LED diodes producing about 400 lumens of light. The light beam is pretty concentrated as this isn’t exactly a flood light, however it produces a decent amount of light to see even in 30 to 40 feet distances. Based on its size and brightness, this is a perfect front door light that will effectively illuminate the walkway to your house. When talking about the fixture itself, it is made out of plastic and is pretty weatherproof with an IP55 rating. One problem with these small wall mounted solar lights is that they tend to have weak housings and are prone to water damage, however, this unit seems to be pretty solid and all open spots have been properly sealed. However, we still wouldn’t recommend to install it in areas where running water could constantly reach the fixture, as it might get damaged. Practically all of these all-in-one fixture solar lights have one problem, there are very limited areas where the light can be installed, because you cannot detach the solar panel form the lighting fixture, meaning that you can only install the light in areas where direct sunlight can reach the solar panel and charge its batteries during the day. Fortunately, the solar panel on this unit seems to be pretty effective at charging the 2200 mAh lithium-ion battery (by the way this is a 18650 lithium-ion rechargeable battery, so there won’t be any problems getting a replacement when it dies). This is a pretty small capacity battery, but because it needs to power only 20 LED diodes, you can expect some impressive working times from the unit, even up to 10 hours on its “always on” setting with a fully charged battery. I must note that these settings only are active from dusk to dawn and light won’t be triggered during the sunny hours when the solar panel is charging the battery of the lighting fixture. Detection distance for the motion sensor on this light is pretty decent, the distance will differ based on the placement position and height of the fixture, but on average will be about 15-20 feet. Going away from the product itself and talking about the manufacturer/brand a bit, we can say that our opinion about these Chinese companies is neutral, it is clearly understandable that most of these products offered by different companies probably come from the same factories, so it comes down to each seller how they value their customers and how serious they are about their business. In this case, we can definitely recommend Litom, as they do address every problem with their lights and will help if you’ll have any problems with the products they sell. While the fixture itself is well built and function exceptionally, there is one problem we found with the design of the light. The switch for changing illumination settings is located in a difficult to reach place behind the light, so you must choose the mode before installing the unit and if later you wish to change these setting, for example from continuous illumination to motion activation only, you will have to remove the fixture to access the switch, change the mode and reinstall the fixture back to its place. This wall mounted, Litom 54 LED solar motion light is a great option for enhancing security around your property, accenting your yard and garden, or lighting up your walkways so you can find your way to the front door more easily after dark. 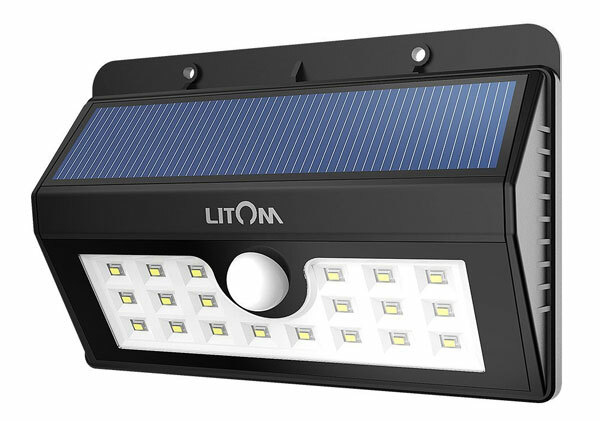 Read on to find out what makes the Litom 54 LEDs one of the best wall mounted solar motion lights on the market right now. This is one outdoor solar light that provides excellent illumination. It comes equipped with 54 LED bulbs that combined deliver a maximal light output of 800 lumens – although you can also choose to run your light in dim, or medium lighting mode. The unique wide-angle design of this light (LEDs installed on both sides of the light fixture) also ensures the light emitted spans a maximum angle of 270 degrees – again, one of the best out there for lights of this sort. The Litom 54 LED also comes equipped with a passive infra-red (PIR) motion sensor that detects movement within a range of 26 feet and 120 degrees. Set your light to dim mode motion sensor or off-motion sensor mode, and it will automatically project maximally bright light as soon as movement is detected, lasting for 17-20 seconds before it returns to the dim mode/turns off. This is eco-friendly solar powered lighting, the 8 watts solar panel you get with this light is made from a polycrystalline material that has a high (17 percent) conversion efficiency rating. All it needs is access to direct sunlight during the day, and it will automatically charge the battery installed in your light so that it is ready to go come nightfall. The panel is housed in sturdy, ABS plastic material that will withstand all weather conditions. There is one lithium-ion battery included with this light. Fully charged, it delivers up to 10 hours of continuous lighting to your property. Both the light fixture and solar panel of this light are housed in ABS plastic that comes with an IP56 weatherproof rating – meaning they will stand up to all climatic conditions, including rain, wind, snow, sleet and more. 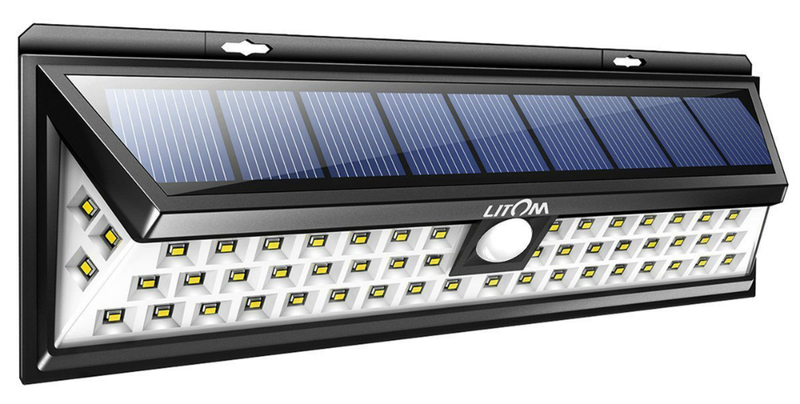 The Litom 54 LED solar light is backed by a full one year manufacturer’s warranty. And there are 16 feet of cable connecting the solar panel to the light fixture. Screws are also included for mounting the light and solar panel on your wall of choice. A remote control option would add to this light’s convenience, especially given that it is a wall mounted light – to change the settings manually, you have to dismount the light each and every time. The inclusion of ground stakes would also enhance it’s versatility, allowing you to install the light and solar panel on horizontal surfaces. Because of these shortcomings, the Litom 54 LEDs light doesn’t quite take the cake as the best wall mounted solar motion light on the market today. If you feel like the previous light by Litom isn’t powerful enough and you need something to illuminate a larger area such as a porch, deck or patio, then definitely check out this light – Albrillo wall mounted solar motion light. The unit is a bit more expensive but also is more powerful producing about 500 lumens of light from 38 LED diodes. 500 lumens of light is pretty decent if we consider that some much higher costing lights produce only few hundred lumens more, so there are lots of applications where you could use this solar motion sensor light. The unit itself is made from plastic as you would expect at this price range, however, the manufacturer is stating that this fixture has got an IP65 rating, which you mostly see on high power solar flood lights with aluminum housings. Whether or not this fixture is fully waterproof we cannot tell you, but it seems to hold up very well in all sorts of weather conditions. The solar light comes with two mounting screws allowing to easily attach it to practically any wall, and also, if you don’t want to drill holes, you can easily use a double-sided outdoor tape to attach it to a wall (not recommended in winter and in stormy areas). Albrillo solar wall light is powered by a 2.5W solar panel that charges 4400 mAh lithium-ion batteries. The unit is supplied with two 2200 mAh lithium-ion batteries, which are 18650 type ones, so it will be easy and cheap to get a replacement when they wear out. 4400 mAh capacity is really good for such light and can easily power it from dusk to dawn when batteries are fully charged. Strong long light mode – continuous illumination from dusk to dawn (or until the batteries die). These settings are very similar to ones provided by the Litom solar light, with the only noticeable difference being that this solar light illuminates for 20 seconds when motion is detected while Litom light only for 15 seconds. What is different, however, is the way you change modes on this light. As mentioned there is a small button right next to the motion sensor which you must press for about 3 seconds to turn the light on and then press it again one, two or three times to change the lighting modes. We actually didn’t like this mechanism and much better preferred the switch on the Litom light, however, the placement of the button on Albrillo light is in a much better and easy to reach position than it was on the Litom light. 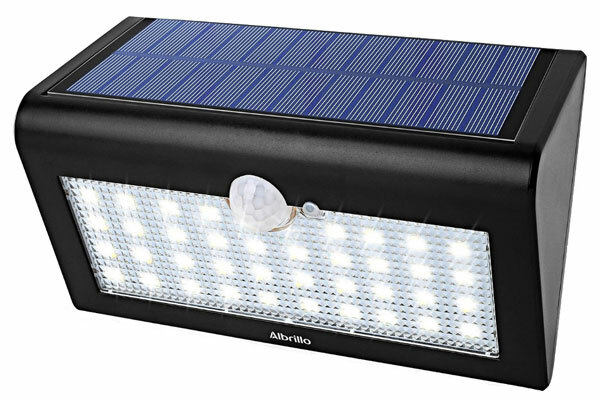 The situation with the manufacturer/brand of the fixture is very similar to the previous light, however, Albrillo says that they will provide an 18-month warranty for the product, which is very rear for a solar light (usual warranty period of a solar light is 12 months). All in all, this is a very good solar wall mounted light which will illuminate your front doors, porch, deck, patio, shed or any other place at night. While the motion sensor itself works very well, we didn’t like the button that you have to use to change the lighting modes, because it sometimes confuses you which setting you have actually turned on. On the other hand, the button itself is placed in a very convenient and easy to access place in front of the light. The LAMPAT 62 LED wall mounted solar motion light is a motion sensor light with two lighting modes. 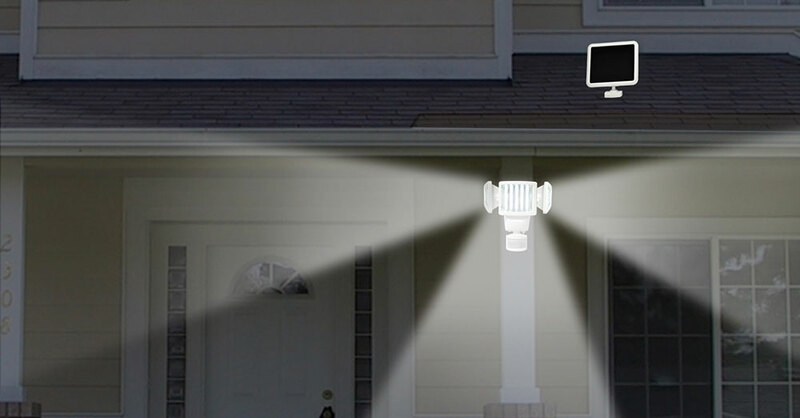 And with 62 LED pieces and wide-angle light beam design, it will provide excellent coverage and security to your yard. However, it is not as bright as some comparable lights out there on the market, and there aren’t as many working modes and lighting options either. The InnoGear Wall Light delivers a super bright 450 lumens of light to your yard, and comes with 4 working modes, including full brightness, half brightness, dim mode and motion sensor lighting modes – it certainly is a versatile little light. All installation and mounting equipment are provided, and the solar panel has an exceptional capacity, translating into fast charging and longer lighting times. Drawbacks included lack of remote control option, and plastic design and construction – not as durable as metal. When to choose budget solar flood lights? There are so many solar lights out there making it an overwhelming task to find the one that best fits your needs. But sometimes you just need a flood light that can illuminate a decent area, is solar powered, has got a motion sensor and doesn’t cost a fortune. Well for those of you who just want a good solar flood light to install around the house or in the backyard at a reliable price, we have gathered this small list of the best budget solar flood lights under $40. This is also a very popular solar flood light and features a very similar specs to our Top Pick, the difference being in 60 LED diodes and a cheaper price. 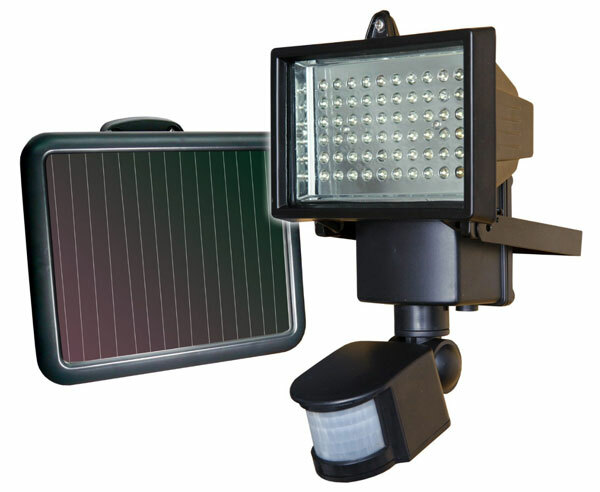 One of the most popular solar flood lights on the market. This fixture is fully equipped with 80 LED diodes, 1W solar panel, 900 mAh battery and a PIR sesnor. Very good specs at a bargain price. This solar flood lights has got a polycrystalline solar panel, 2000 mAh lithium-ion battery, adjustale mounts and a PIR sensor. The best solar flood light under $40 definitely is this Sunforce 82080 light. It is also one of the most purchased solar flood lights on the Amazon maintaining a decent 4.2 rating and there are good reasons for this. First of all Sunforce 82080 is affordable and has got good reviews from thousands of people that are using this fixture. When looking at the light output, you can expect around 800-900 lumens of light from 80 LED diodes, it will light a 20-30 feet area without any problems. If you need to light a larger area, say a backyard or garden, purchase multiple of these lights and install in each corner to give you a large coverage of light. The fixture itself isn’t anything too fancy, the casing for the fixture, motion sensor, and the solar panel is made from plastic, so you should install the fixture in an area where it is less exposed to any type of water. However, it should withstand any “normal” weather conditions such as rain, snow, hot and cold weather. And at this price range, it is almost impossible to find a fully weatherproof solar flood light. The fixture and the solar panel is pretty easy to install to a vertical surface and the cable length between the solar panel and the fixture is 15 feet giving you enough options to install a solar panel in an optimal place to get the most sunshine throughout the day. The unit is charged by a 1-watt amorphous solar panel, not the most efficient solar panel on the market, but good enough for this light, and it also helps to keep the price low for the fixture. The power is stored in a 900 mAh Ni-MH battery pack which consists of five AA type batteries. Of course, this is a pretty low capacity battery that would be waistless for a dusk to dawn flood light, but considering that this a motion activated solar flood light that isn’t continuously illuminating but only turns on for few minutes when motion is detected, the battery should be able to power the flood light throughout the night. Sensitivity – how sensitive the motion detector is or in other words, in how far distances the sensor will pick up motion. The switch to adjust the sensitivity of the sensor is conveniently placed under to motion sensor, so you don’t have to dismount the light from the wall to access the switch. In the best case scenario, we would love that the light came with a remote control so these settings could be adjusted from a distance, however, this is not expected from a flood light that costs less than $40. Sunforce is providing a 1 year warranty for this solar flood light. Sunforce 82080 has got many things we like such a powerful and bright light, adjustable motion sensor with long detection range, rather good solar panel and of course, a very attractive price. However, there were also some drawbacks to the flood light. First, the battery used on this fixture has got a low capacity, meaning that it cannot provide a continuous illumination from dusk to dawn (it also doesn’t come with a dusk to dawn setting), but if you only need a motion activated flood light, this isn’t really a con for you. And second, the housing of flood light is not the most waterproof we have seen, so to prolong the lifetime of the fixture, we would suggest to even further waterproof the fixture by filling all seams with silicone and installing the fixture in an area where it is not constantly exposed to water that could damage the flood light. If, for some reason, the Sunforce 82080 we reviewed previously didn’t fit your requirements or simply isn’t available, the next best budget solar flood light we can recommend is Sunforce 82156. When comparing it to the other Sunfoce light, this unit has got 20 LEDs less which results in about 50-100 lumens less brightness (you will hardly notice the difference) producing a total of 850 lumens of light, and it is also few dollars cheaper. The area of usage for both of these lights is pretty similar, so it basically comes down whether you need a little brighter flood light for few dollars more or can easily live with this 60 LED model. When we look at other specifications of the fixture beside the light output, it is powered by a similar 1-watt amorphous solar panel which charges the same Ni-MH five AA battery pack with 900 mAh capacity. However, because this light has got 20 LED diodes less than the other fixture but the same solar panel and battery, you can expect it to run a little bit longer with one charge. The manufacturer has indicated that it can illuminate at maximum brightness for about 45 minutes continuously and because this is a motion activated flood light, you can expect it to be able to last throughout the night. The unit itself this time is made from a mixture of aluminum and plastic materials, which we don’t think has any impact on the durability or waterproofness of the fixture, however, it looks a little bit better than all plastic light and feels more durable at the same time. It also has got a 15 feet cable to connect the solar panel to the fixture giving you enough installation options for the fixture. PIR motion sensor used on Sunforce 82156 is very similar to the one used on Sunforce 82080, it can detect motion in up to 30 feet distance in a 180-degree range around the fixture. You can also adjust the Lux (level of darkness required to turn the light on), Time (for how long the fixture will illuminate after motion has been detected) and Sensitivity (in what range the motion sensor will pick up motion). The motion sensor can also be adjusted horizontally and vertically. The fixture itself, however, can only be adjusted vertically, so you may need some additional mounting if you also want to be able to adjust it horizontally. Manufacturer Sunforce provides a 1 year warranty for this solar flood light. The first thing we believe could be improved with this fixture is its waterproofness. Depending on the area you live and quality of the unit you’ve received, there is a high chance that you won’t face any problems such as water damage for many years of usage. However, if the area you’re living is common to have long or hard downpours, wet winters or similar weather conditions, we recommend that you improve the waterproofing of the fixture, motion sensor and solar panel by sealing seams with silicone or similar sealant. It won’t take you much time but will ensure that the fixture continues to work as intended in any weather conditions. Also, one minor problem we found with this solar flood light (which is very common for cheaper lighting fixtures) is that the mounting hardware (screws for attaching the light and solar panel) is pretty bad, we would recommend you to go to the local hardware store and purchase more durable and longer lasting screws that would secure the fixture on a wall or roof in any weather conditions. 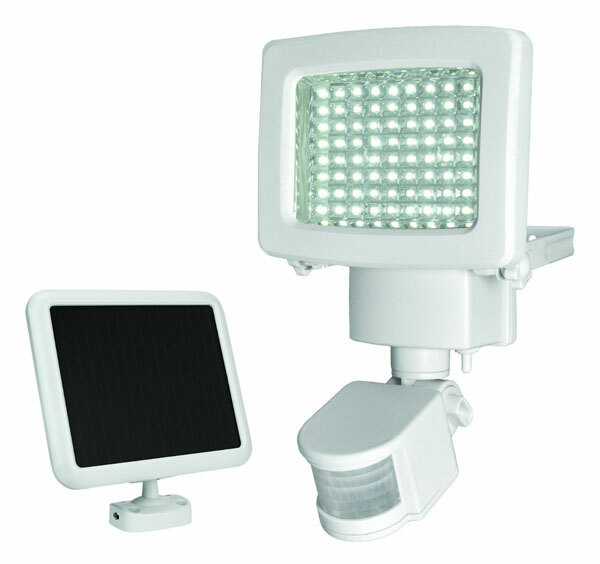 Here is another equally good solar flood light – Robust Solar 80 LED. It is a bit more expensive when compared to both Sunforce lights, however it also offers few additional features such as a polycrystalline solar panel, a bit higher capacity lithium-ion battery and more adjustability for the fixture. Starting with the brightness, this solar flood light outputs pretty decent amount of light, 80 LED diodes produce around 700-800 lumens of bright white light. When comparing this model with both Sunforce flood lights, it is very difficult to tell the difference between all three of them in terms of brightness, so this light, similar to both Sunforce models, will lit an approx. 15-25 feet area. 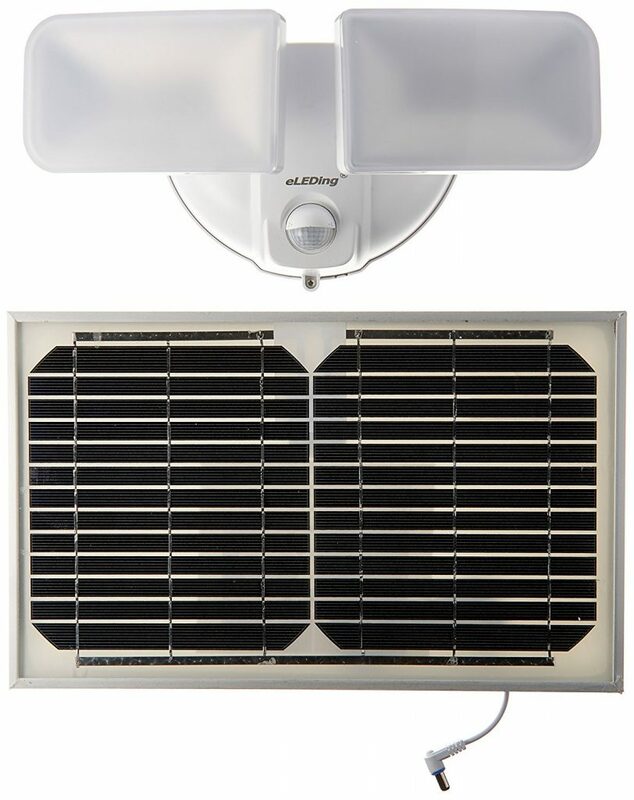 As a plus, this light uses a polycrystalline solar panel, although the wattage is similar to Sunforce models – 1 watt. The battery used in this unit is 2000 mAh lithium-ion, the same 18650 type you will find in many other solar lights. The battery capacity is decent enough to power the light throughout the night, and because this is a motion activated flood light only, there is no option to set it to illuminate continuously from dusk to dawn. Manufacturer states that you will get about 200 triggers of 60-second illumination with a full charge, which seems to be right considering the battery capacity of the flood light. Robust Solar 80 LED solar flood light’s construction is made from both plastic and metal materials, for example, the housing of the fixture is made from metal while the mount, motion sensor, and solar panel frame are made from plastic. The cable connecting solar panel to the flood light is approx. 16 feet long. One thing we really liked about this light is that its mounting hardware allows to adjust the fixture not only vertically, but also horizontally, so you don’t have to make any additional mounts if you want to adjust the lighting angle to one of the sides. The motion sensor can also be adjusted vertically and horizontally. The PIR motion sensor has got two adjustable settings – Lux and Time. Lux setting allows to set the level of darkness needed for light to start working and Time setting allows to set the time of how long the fixture will illuminate when it has detected a motion. You can set the illumination time from 3 seconds up to 10 minutes. 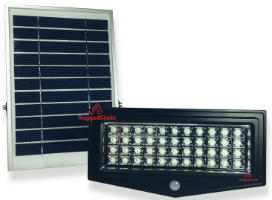 Robust Solar has a very good customer service and they also provide a 1-year warranty for their flood light. The thing we didn’t like the most about this solar flood light was the mounting hardware that is made out of plastic and does not seem that durable. Most people will be fine with this mounting hardware and won’t notice any problems, but those living in areas with higher winds and storms might consider upgrading it to something more durable, probably made from metal. The second thing we didn’t like (which is very common to cheaper lights) are the poor quality screws for installing the unit. We definitely recommend changing them to more durable ones that you can find in your local hardware store. And last, the motion sensor doesn’t allow to adjust the sensitivity in opposite to both Sunforce lights, which is a useful feature if you need to adjust the detection range and distance, for example, to only pick up motion from humans (and ignore animals) or to pick up motion from humans and also from smaller animals. The Magictec COB Lights are solar powered with a long working time, and two lighting modes including a sensor lighting mode for warding of intruders. It is super bright, with 600 lumens maximum light output. These are some of the most affordable lights of this sort out there today. However, the plastic construction is a bit flimsy and lightweight, and there is no remote control included either. And there aren’t as many working modes as you get with some other lights out there. Frostfire Digital 80 LED Solar Flood Light – Another light which is worth looking at is this 80 LED Solar Flood Light by Frostfire. What caught our attention to this product is the digital control panel for motion sensor that not only allows to adjust the Time and Lux settings, but also shows the current battery level, which is a very useful feature that we didn’t find in practically any other solar light. I’m looking for a solar light that can provide 15000 lumens brightness. But I don’t know if there really exists one like this. Could you help me check if there is one? My field of expertise is mostly with regular household solar flood lights which don’t usually produce more than 2000 lumens of light. 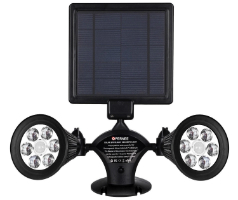 The thing with these very high power solar lights is that they are way too expensive for an average homeowner, because you need a high capacity solar panels (that not only take up a lot of space but also are expensive) and large battery packs which also take up space and are difficult to transport due to their weight. Now, for a solar light that can produce 15000-20000 lumens I would either look for a custom solution (maybe attaching light to an existing solar system) or for specifically designed area lighting. There are few Chinese solar lights that claim to reach 20000 lumen brightness which I have never tested or owned so I cannot say anything about quality of these lights or accuracy of their lumens measuring. And another company that rents out high power solar lights is this – http://www.solarlightingtower.com/. You can contact them and maybe they will be able to assist you better than I would regarding high powered solar lighting. Hope that this helped you at least a bit and good luck for finding the light you are looking for. This is a good resource. Thank you! This is the only site I came across that gave actual honest reviews and comparisons of different lights, including cons. It’s especially valuable to get in impression of water proofed-ness, and “real world” light coverage comparisons. Thanks! the mounting bracket that holds the solar panel for the 80 LED solar flood light. I need the bracket that holds the solar panel. where can I buy one or two of these brackets? I don’t want to buy another whole light just because the plastic tube that holds the solar panel can’t be fixed or repaired. If you’re talking about the Robust Solar 80 LED light than the first thing I would suggest you to do is to contact the manufacturer directly and they should assist you with this problem and even replace the bracket if the light is still under warranty. Contact them here. If this doesn’t help, I’m afraid you will need to come up with some DIY solution, because most of these small solar lighting manufacturers usually don’t sell spare parts for their lights. This article is very helpful for me and I really appreciate the detail. I have a backyard area that I would like to light up on command (not all night long – i.e. have an on/off switch). The reason is to allow kids to play outside when it gets dark early. Would the MicroSolar IP65 120 LED do the trick you think? I am not looking to light a statue or have a sensor or anything like that. Just light an area for some kid play time in my backyard since it gets dark at 5:15 where I am. Thanks!!! As for the light, the MicroSolar 120 LED unit is a great light, but whether it is the correct option for you depends on the area you need to illuminate. Perhaps if you have a small background and need to illuminate a small area for you kid to play, you may choose a cheaper and less powerful option. On the other hand, if you want decent enough illumination, this may be the best choice. Great article thank you! I think I am in a similar situation to Mike who commented above. I would like a solar light with an easy on/off option (wire a switch thats easy to reach every day or a remote) to light a barn in my very dark backyard. Hard wiring isn’t an option. I want to light the inside and out with reasonable brightness. Should I look into battery powered LEDs for the inside of the barn? It’s only about 40ft long and open to the outside so some light from outdoor flood lights would come in. Any tips would be appreciated! Yes, Liz, battery-powered LEDs could be a great option for you if hard wiring isn’t really an option for you. But I would recommend you also look into solar shed lights. These lights not only come with a wire switch but also don’t require any wiring. Just place the solar panel outdoor, the light indoor and use it without having to change the batteries for the light every few months. I’ve considered solar flood lights but didn’t know how useful they could be for home safety. I was really happy to learn about the all-weather suitability of the Guardian 580x. Finding quality solar flood lights is very important and I’m really grateful for your reviews! I think the Sunforce 200 dual motion solar light is the best of its kind on the market, but it is not readily available. The one store that had the best price is completely out of stock. In short, this model is the latest from sunforce. It is smaller than the previous models and it looks so much better. I agree, Marge, the Sunforce 200 dual motion solar light does look really, really good.